Deal Heritage is an initiative by The Deal Society to promote the history and heritage of Deal and Walmer. We have a wonderful range of historic places for you to visit, or you could walk round some of our Plaques and Memorials. To hear news about what is happening locally, just sign up for our newsletter on our Keep In Touch page. 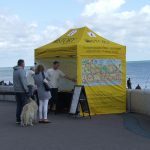 You can also find out about our heritage any Friday, Saturday or Sunday (weather permitting) from the History Project tent on Deal Seafront.